LVM supports Verizon Wireless in implementing its first-ever Latino Small Business outreach program, titled ‘Organiza. Crece. Triunfa.’, aimed at strengthening small businesses through technology. 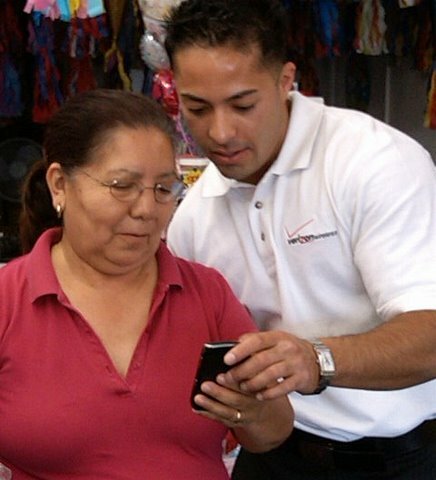 Create an authentic partnership between Verizon Wireless (VZW) and Latino Small Business owners. Demonstrate VZW’s commitment to helping the Latino business community grow by providing reliable resources, products and services. Implemented a strategic program, throughout densely-Latino areas in California, aimed at empowering Latino Small Businesses through the use of mobile and wireless technology. Trained bilingual ambassadors to visit ‘microempresas’ (small businesses) and educate owners on using technology to grow their business. Supported the creation of the VZW Latino Small Business Online Directory. Forged relationships with Hispanic Chambers of Commerce to garner additional exposure for the program and taught business owners how to apply for Verizon Wireless’ Small Business Awards. This groundbreaking program marked Verizon Wireless as the first telecommunications company to actively engage the Latino Small Business community in the United States. It enabled the brand to establish a genuine relationship with over 3,000 businesses in California, about 20% participation from all targeted. It drove a minimum of 900 new sales and acquisitions and built an engaging and resourceful website that attracts around 25,000 new visitors a month. Over 30 regional and national media placements were published about the program and Latinos continue to perceive VZW as the company that cares about their community and small businesses.